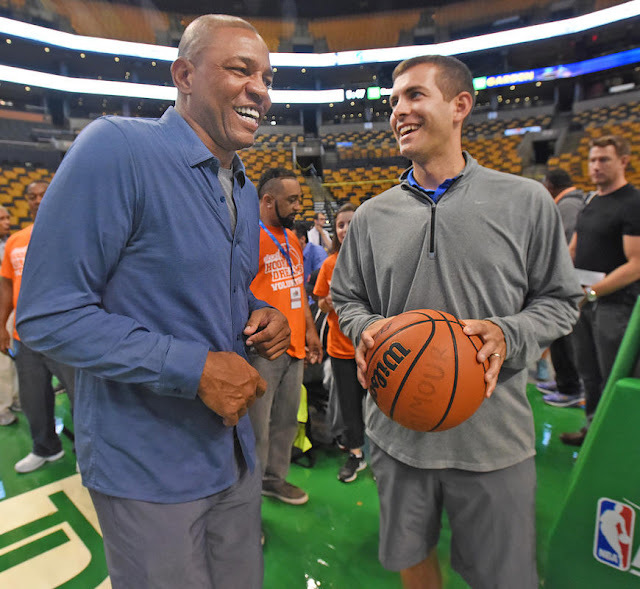 Doc Rivers praises Boston's rebuild - what's next for both? Doc Rivers had success with the Celtics. Not so much with the Clippers. What's in the future? I mean, I think Cleveland and them are obviously the two teams to beat in the East, but this tells you why I think Danny and I were successful together, and it’s why Danny and Brad, they’ll be successful, is because they’re never scared to make moves or changes. The most interesting portion of that quote is the "Danny and I were successful together" segment. That success, particularly the 2008 championship, occurred mainly because of Ainge's trades for Kevin Garnett and Ray Allen. Boston just traded for one of the top guards in the league in Kyrie Irving, and the Clippers lost one of the best in Chris Paul. There are many observers that feel Doc has underachieved in the past few years. His team has been ousted from the playoffs in the first round for the past two seasons. Here is a timeline, and let's see if you detect a pattern. In 2014 Rivers was promoted to President of Basketball Operations for the Clippers. On June 14, 2017 Jerry West, formerly of the Golden State Warriors, announced he was heading to the Clips organization. On June 28, 2017 Chris Paul was traded to the Rockets. On August 4, 2017 Rivers was stripped of his duties as Clips President. Changes are happening out west. Most of us know of West's fine record with the Shaquille O'Neal/Kobe Bryant Lakers and the Warriors, but few remember what he did with the Memphis Grizzlies. He became GM of the Grizzlies in 2002 and fired coach Sidney Lowe after a 0-8 start to that season. He quickly brought in Hubie Brown as coach, a controversial move. Hubie was 69 at the time, and considered over the hill. Next season Memphis went 50-32, making the playoffs for the first time in team history. Hubie Brown was named Coach of the Year, and West was named NBA Executive of the year. Nice work for both Jerry and and the old guy. What does this indicate for Doc Rivers and the Clippers? First of all, if West truly believes Rivers is not the coach to turn the Clips around, Doc very well may be gone. Danny and Brad generally seem to have very similar ideas on a vision for the Celts. If West and Rivers don't share a vision, guess who goes. Doc Rivers told us recently the real reason he left the Celtics is because he wanted to have the chance to build his own team. He said it wasn’t because he didn’t want to rebuild with the Celts, who’ve been on an accelerated reconstruction pace since 2013. Does Doc Rivers regret his decision to leave the Celts for the Clips? To some extent, yes, he wishes that he had remained here. The Celtics team has the potential to win now and down the road. The same can not be said for the Clippers. The decisions, moves and non-moves by Doc as Clippers President did not work out. They need a rebuild. Whether that comes from smart drafts, trades or free agent signings is mostly up to West. The Clips definitely have trade assets in Blake Griffin and DeAndre Jordan. One of Danny's stategies is to assemble assets and make major trades. West does not have a history of blockbuster trades. His trade for the Lakers Kobe Bryant may have been his biggest. He builds from the draft, including Stephen Curry, Klay Thompson and Draymond Green. He also builds from free agent signings, such as Shaq and Kevin Durant. But a trade may be in store for the Clippers, and Doc's position there might be tenuous. Doc Rivers' comment about his tenure with the Celtics was meant to remind people of his past successes. He realizes that his image has taken a bit of a beating in recent times. He just didn't have the success with the Big Three of Paul, Griffin and Jordan that he did with the potent Pierce/Garnett/Allen trio. 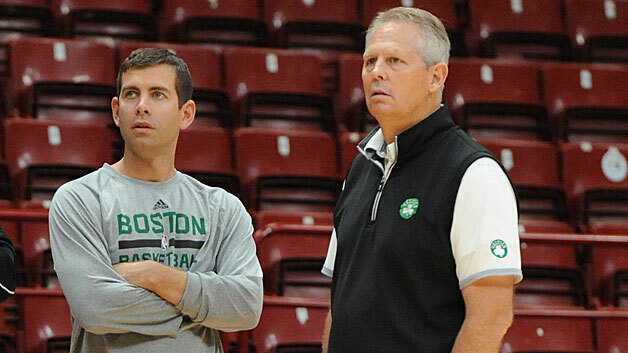 Doc Rivers abandoned #Celtics for contender b/c didn't want to rebuild. Brad Stevens led C's to conference finals before Clippers got there. Rivers has had only moderate success as Clippers coach and virtually none as President of Basketball Operations for the club. 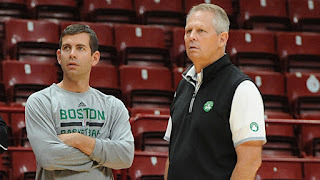 Ainge, conversely, has made some gutsy moves (perhaps lacking in compassion and empathy) that have brought the Celts back to their winning ways. I am sure Doc wonders what if! If the Clippers season gets off to a bad start (remember Memphis), there may be a coaching change. And back to Danny. With regard to that 15th roster spot, we can't forget that he is an asset assembler. Pick up a youngster-allow Brad to improve the player's skills- then package the youngster and work a trade that will strengthen the team. Shabazz Muhammed, JaMychal Green and Thomas Robinson are possibilities. Danny's next move may not involve a player simply filling an immediate need. That's the way the man thinks. You just know he's not done.